Yesterday, at high noon, I marched boldly into the kitchen to face ranks of sticky wine glasses and crusty forks and Sunday plates plastered with dry salad leaves. Dirty dishes advanced in rows across my counter. I threatened them with a damp pink dishrag—an empty threat at the time, and I think they knew it. I had been waiting all morning for an ally to arrive and help me break through these enemy lines, to save me from from inglorious defeat at greasy, unwashed knifepoint. I was, in short, waiting for the plumber. This would be, if I'm counting right, his eighth visit to our home in six months. We take pains to show hospitality (as the echelons of dishes could attest), frequently inviting guests to share our table and our conversation. Nevertheless, the plumber, I am ashamed to say, has been ushered in through our door more often than any other visitor this year. Earlier this spring, a basement that refused to stop filling with water was what first brought him to our front step. By the time we realized we were living above a small flood, we were forced to dispose of twenty square feet of moldy green shag carpet, nine sodden wood pallets, an armload of mildewed baby items, and two foully discolored mattresses. Hoping to locate and put an end to the problem, we transferred all of our surviving items from the basement to the shed. But we failed to find the source of the leak; the walls continued to seep and drip and run onto the floor. This clearly called for the deployment of special forces. Hence the plumber. First, he came and assessed. Not surprisingly, the leaking continued. On the next visit he installed a new shower drain. More leaking. He arrived a few days later to rummage around and perform minor surgery in the crawl space. Still leaking. After that, he replaced a huge chunk of knee-shaped pipe in the basement itself. That seemed to do the trick. Mostly. Even experts must sometimes work by trial and error. After four house calls from the plumber—and one from a gutter specialist—the copious leakage has been reduced to a trickle, which is, I suppose, as good a state of affairs as anyone could expect in a 114-year-old coal cellar. At least we now know better than to trust any important belongings to that dank and musty cave. If only we were collectors of fine wines. We invited the plumber for the fifth time—as a far more welcome guest—in June to install a lovely new dishwasher. With the leak in the basement more or less stopped, and the dishwasher performing its function dutifully, we had a few peaceful, plumber-free months. And then last week our kitchen sink quit draining. Or rather, after filling up both sides of the sink, it drained sluggishly into our dishwasher and from there onto the floor. So I plunged. I ran the disposal. I set the dishwasher on "pot scrubber" and let it scrub away. But my attempts only made the overflow worse. Back came Mr. Plumber again with metal snakes and heavy wrenches and rust stained towels to investigate the unpleasant bowels of my home. It's a grimy, sleeves-rolled-to-the-elbows, belly-on-the-tiles kind of job that this Lysol-wielding housewife would not want to touch. I prefer to let others do my dirty work for me. After hearing a good deal of grunting and rattling from under the sink, I expected to eventually hear a victorious swishing of water through open pipes. But apparently the snake wasn't long enough to reach the clog. On the following day the plumber returned with a complete arsenal, ready to do battle with the retrofitted guts of this stubborn old house. The noises coming from below our lunch table were promising: something like the concussive chatter of jackhammers and the report of gunshots. And this time, the promising noises delivered. Oh the joy of a functional drain! Three days later, I noticed that the dishwasher still contained a puddle of cloudy water. And when I ran the garbage disposal, the puddle grew deeper. Soon after that, the disposal made a wretched crunching sound followed by a subtle buzz. And each time I rinsed a dish, the dishwasher puddle deepened and the sink drained more slowly. On Sunday night, the sink would no longer drain, and the dishwasher was once again spilling its murky contents onto the mismatched towels I had wadded beneath its door. And so yesterday afternoon my faithful ally in dirty blue jeans and steel-toe boots came to my aid once again. No matter that he tracked mud across the just-vacuumed rug. No matter that he sloshed puddles on the recently mopped tile. In twenty minutes he had my disposal grinding efficiently through chunks of stale bread and bits of zucchini peel. And that daunting army of dishes now lies overturned on the rack of my perfectly draining dishwasher. A greasy knife is no match for a fully functional sink. I waved my pink dishrag in triumphant farewell to our plumber, hoping that I will never have cause to invite his help again. As a certain former president might say, "Mission Accomplished." Plumbers are brave and wonderful. I'm glad yours is so faithfully employed. That was Kristen - didn't know I was on Joost's account. Oh that sounds a lot like our basement except ours was the shower, and then the toilet. So yucky. But I'm glad he got it all fixed! I hope that it didn't also drain your wallets. Maybe you could get a punchcard or frequent customer discount? "Your 10th visit is free" might work well with your drains! 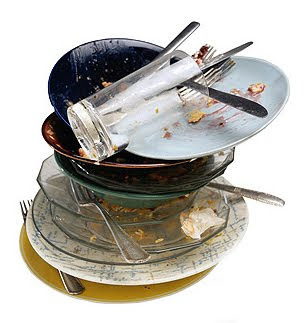 We had a similar disposal/dishwasher/toilet backup last year, about a half hour after Christmas dinner was over! I wish I could help you with all your dishes...I actually don't mind doing them at all!